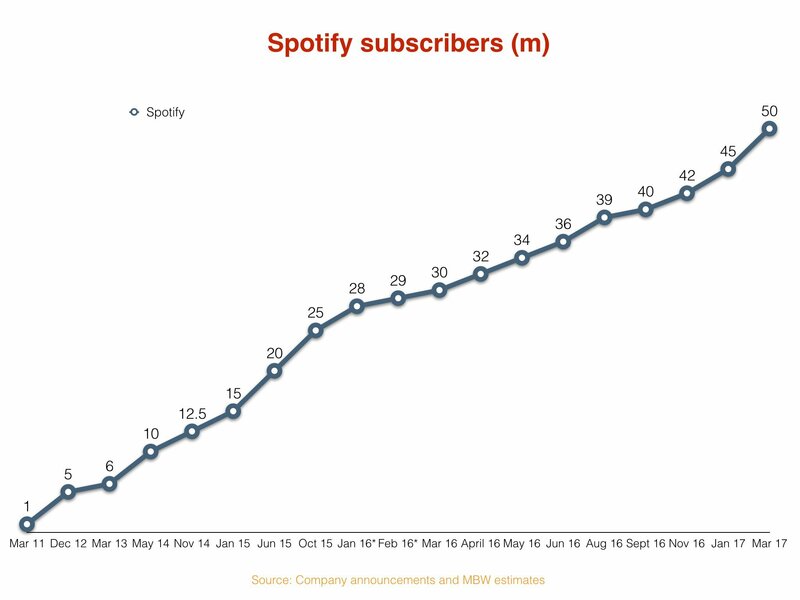 Spotify has officially reached 50m paying customers – a jump of 10m from six months ago. It’s an impressive climb, and over double the latest equivalent figure from Apple Music – but actually represents a slowdown in subscriber growth percentage terms. In January 2015, Spotify announced it had 15m subscribers. Five months later, in June 2015, it had reached 20m subs. That was a 33.3% rise within a half-year. Spotify’s next big official subscriber announcement came in March 2016, when we learned the platform had 30m paying subs. That was up 50% on the 20m announced nine months before. Another six months later, in September last year, Spotify announced that it had topped 40m subscribers – once again up 33.3%, or 10m, on the 30m figure. Yesterday (March 2), Spotify confirmed that its platform has now surpassed 50m subscribers. It’s a big moment in the company’s history – but means that in the six months between September’s 40m milestone and the new 50m figure, Spotify posted a 25% subscriber increase. Then again, if (by adding 10m subscribers every six months) Spotify’s growth has now hit terminal velocity, it still points to a bright 2017 for the streaming platform – and suggests its subscriber base could reach somewhere near 70m by the end of this year. Major music rights-holders remain out of long-term contracts with Daniel Ek’s company, with no conclusions to fresh licensing negotiations so far. Since Spotify’s long-term deals with the major labels expired, the likes of Pandora, iHeartRadio, Amazon and SoundCloud have signed multi-price licensing agreements with the music companies. As reported earlier this week, Spotify is now waving goodbye to key executives Francis Keeling and Petra Hansson. These execs follow the likes of Chief Revenue Officer Jeff Levick, content chief Ken Parks, EMEA sales boss Jonathan Forster and label relations head Steve Savoca out of Spotify. Savoca recently joined Apple Music to head up its New York office in a label relations role. Estimates suggest that, if Spotify’s valuation of $8bn is accurate, Daniel Ek owns a stake worth $825m.